The Central West Florida road trips and scenic drives recommended by Florida Backroads Travel are often staged on the back roads around Tampa. I-4 is the main east-west interstate highway in this region, and traverses the state from Daytona Beach through Orlando to Tampa. 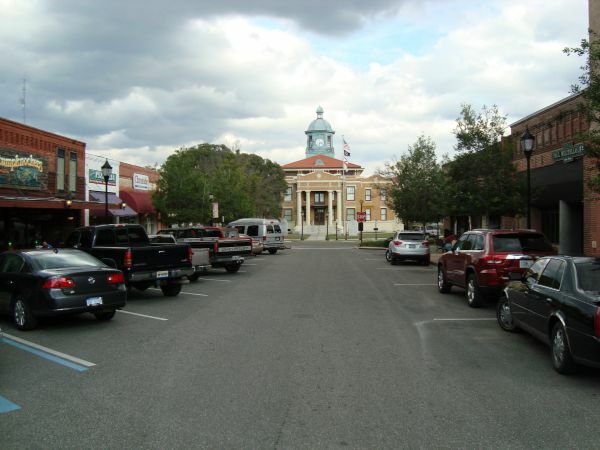 This urbanized area is known as the I-4 Corridor. 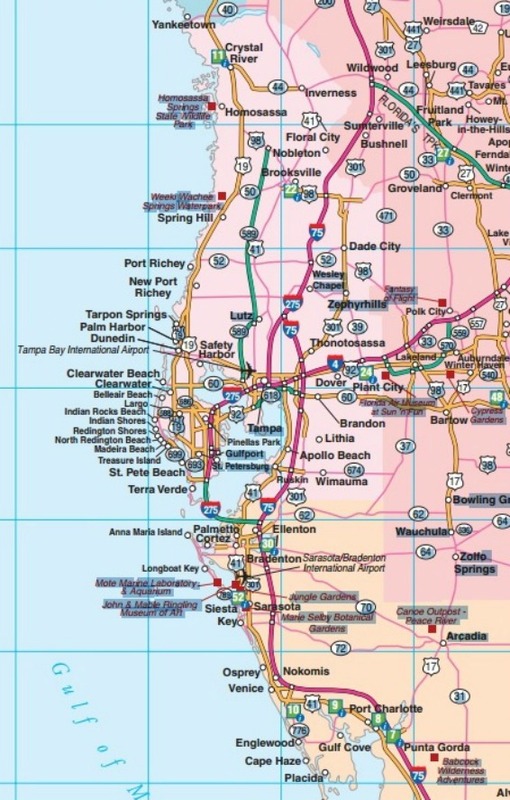 I-75 is the north-south interstate, and enters Florida near Jasper and meanders down the center of the state until it starts veering west toward Tampa. I-75 goes all the way to Miami. The Suncoast Parkway is a north-south toll road that starts in Tampa near the airport and terminates on US-98 north of Brooksville. 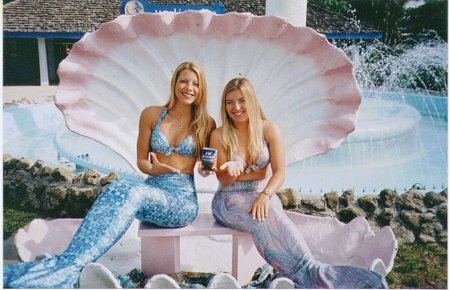 The I-4 and I-75 exits are crowded with gas stations, restaurants and motels. 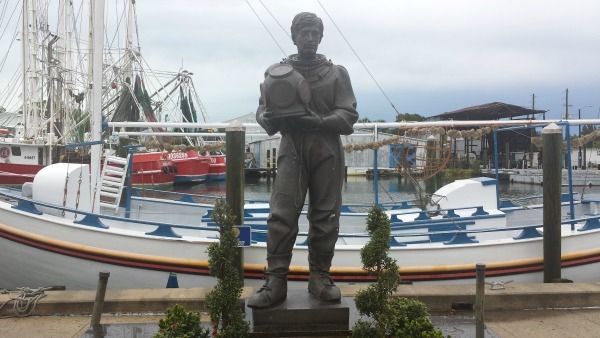 You can travel the state quickly and easily on these highways (except during rush hours), but not see as much scenery or real towns as on our recommended Central West Florida day trips. The town signs you do see are usually a few miles from the downtown section. The fun begins when you get off the interstate and hookup with the less traveled roads that go through our many smaller Florida towns. 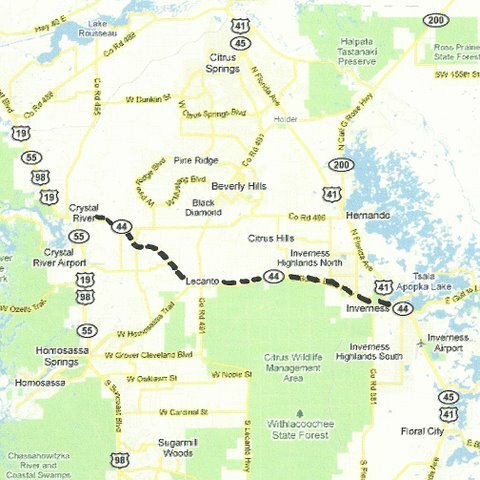 The maps below show the routes of a few Central West Florida day trips that I recommend. SR-476 from Bushnell west to Nobleton. Then north on SR-39 to Floral City, through Istachatta and Juneau. Peaceful country, parallels the rails to trails project, the Withlacoochee Trail. About 24 miles. 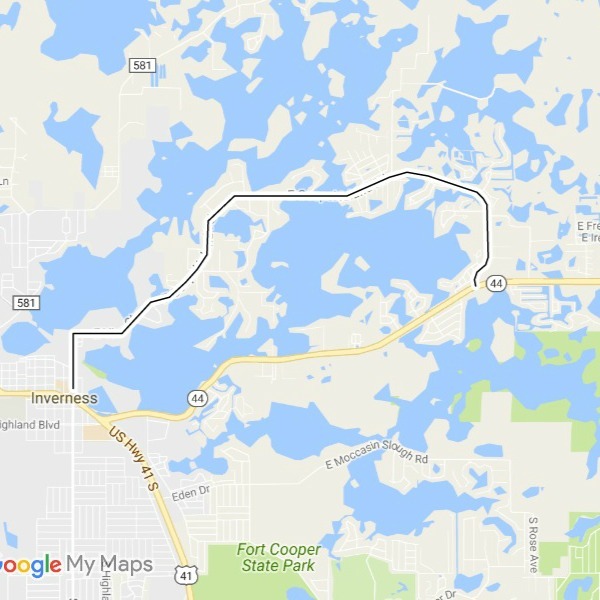 Sr-44 from Inverness to Crystal River through Lecanto. Pretty hills and lake views. About 18 miles. 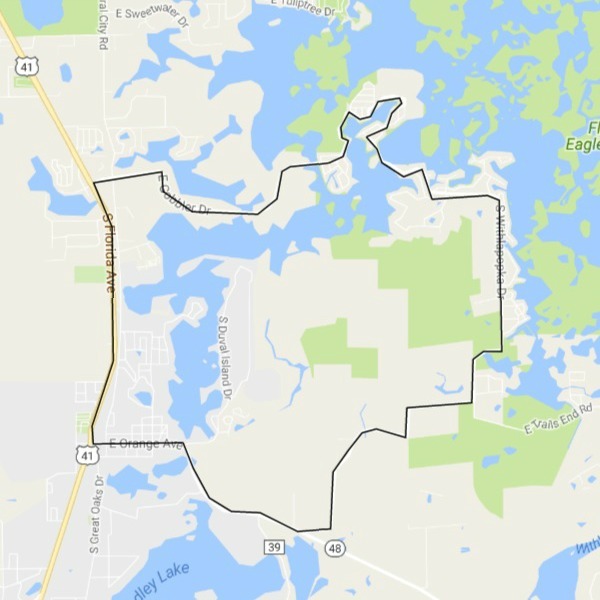 SR-595 from SR-50 just west of Weeki Wachee south to Hudson, through Hernando Beach and Aripeka. Low country, fishing villages, marshes, houses on stilts. About 18 miles. 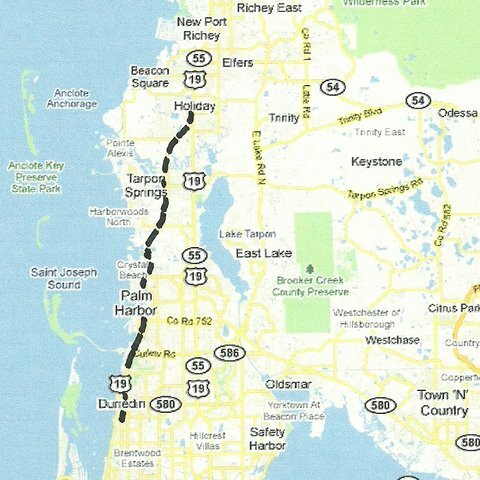 SR-595 aka Alternate US-19 from Holiday south to Clearwater through Tarpon Springs, Palm Harbor, Ozona and Dunedin. 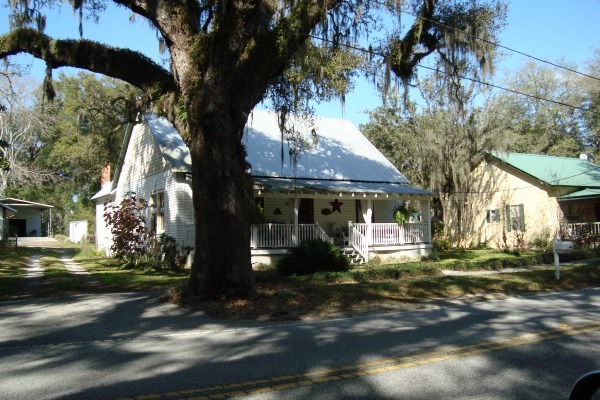 These are old Florida towns with a lot of interesting houses and plenty of trees. About 18 miles. Here is a way to come into Tarpon Springs from the north and avoid a few miles of that awful congested US-19. Just south of New Port Richey leave US-19 and go west on Trouble Creek Rd. Follow it until it turns south and becomes Straub Memorial Drive. 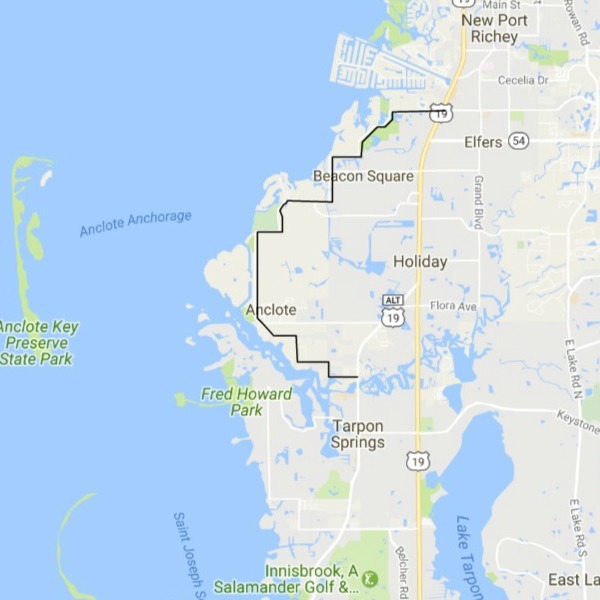 Stay on Straub until it comes to Bailles Bluff Road then follow it south to Anclote Rd (not Blvd) then stay on Anclote Rd until it comes back to Alternate US-19 just north of Tarpon Springs. About 9 miles, some residential, a lot of mangroves and parks. This is the Gospel Island Bypass around Inverness. A great scenic drive. From downtown Inverness go north on N. Apopka Ave until it turns right and becomes CR-470. 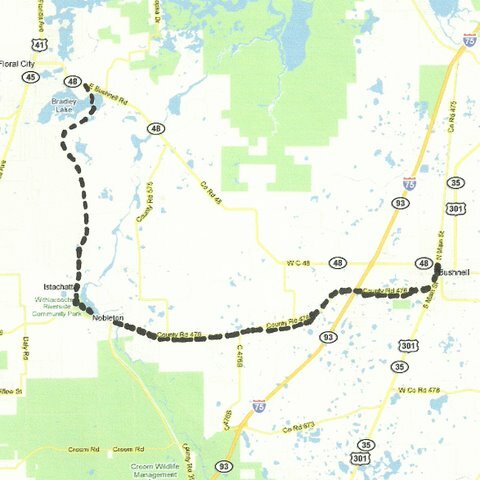 Follow its meandering route among the lakes and oaks to SR-44. The Gobbler's Drive Loop. From Aunt Martha's Produce Market in downtown Floral City on US-41, go north to E. Gobbler Drive and turn right (East) and follow it through the lakes and woods and peninsulas among Lake Tsala Apopka along South Withlapopka Drive and East Trails End Road back to CR-48 and on into downtown Floral City.